My good friend Amy moved into a new place in Hollywood. 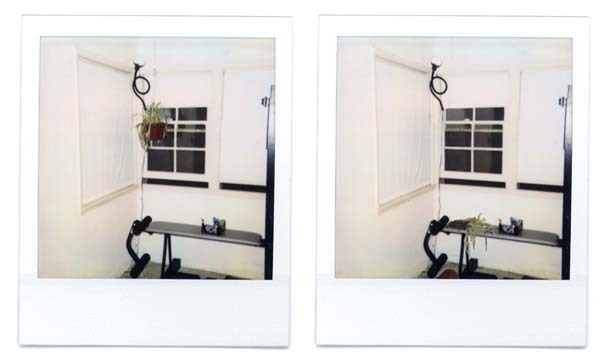 I sent her some polaroid film and asked her to take some pictures of her place. The picture on the left is one she took. While talking to her on the phone one day, she told me that she had been awakened during the night by a loud noise. It worried her, as loud noises are wont to do. She eventually figured out that the rubber band which was keeping her plant up had snapped and it had fallen to the floor. So I modified the image to reflect the new information. I sent her a copy but haven't heard if she got it yet. I hope that was the right plant.